Diabetes rates are soaring – How can we stop it? This topic is near and dear to my heart. I am re-posting this blogpost, which was posted on June 29, 2011 by the Instituted for Integrative Nutrition (my nutrition school), in hopes that this information will be distributed to many of our loved ones who have diabetes. Please forward this blogpost to your friends and followers. Thank you. More than 350 million people worldwide now have diabetes. That’s greater than the entire population of the United States (307 million), and more than double the number of diabetes cases in 1980. These frightening statistics fromThe Guardian will only get worse if we do not make dramatic changes to the our accustomed lifestyles. By 2020, the UnitedHealth Group anticipates that 50% of Americans could have diabetes or prediabetes. As much as 95% of these cases are predicted to be Type 2 adult-onset diabetes, a condition highly correlated to obesity, poor diet, and lack of physical activity. In some cases, the condition can lead to kidney failure, heart attack, or stroke. Non-smoking adults at a normal weight who eat a healthy diet and get regular exercise have been proven to be 89% less likely to develop diabetes. That’s a very encouraging prevention statistic! What about those already diagnosed with diabetes? Just earlier this month, researchers had a breakthrough in diabetes care. As reported by the BBC, eleven people who had been diagnosed with Type 2 diabetes underwent a drastic eight-week diet regimen of 600 calories a day. At the end of the study, 7 of the 11 participants no longer had diabetes. The researchers anticipate that by combining a healthy diet with regular exercise, these former diabetics may be able to live diabetes-free the rest of their lives. 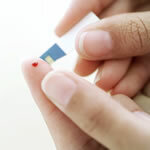 This is great news for those 350 million already coping with diabetes. In a 2009 documentary, Simply Raw, six diabetics switched to a raw food diet for 30 days and found their “incurable” disease wasn’t so permanent after all. The prevention and the cure are based on the same principle – live healthfully. We can start reducing the number of people affected by diabetes as soon as we can embrace the lifestyle we all know we should: eat right and exercise. What advice do you have for someone battling diabetes?